Despite my passion for cricket I have to confess that my playing days brought me limited success on the field. In fact if I am entirely honest had I not had a relatively safe pair of hands, and always been willing to make up for my shortcomings with bat and ball by throwing myself around in the field, I would seldom have got a game at all. For years I consoled myself with the thought that one or other, or perhaps even both of my sons, would have all the ability I lacked – after all my father was a fine cricketer and they do say that talent sometimes skips a generation, or perhaps that was just my parents trying to console me. I will never know however as I failed miserably in my attempts to inculcate in my boys any sort of interest in the game, let alone a desire to play. Why, having turned away from religion when I was twenty, do I always visit churches, cathedrals, temples and mosques? Why when I am on a walk in any part of London or Kent, in any village or unremarkable town or on holiday in any country, do I “do a Larkin” and end up alone inside a church and always at a loss much like this? Is it that hunger in me, that hunger to be more serious, is that what it is? Even more, why has superstition become such a problem in my life? Why do I allow myself to be dominated by an absurd portfolio of beliefs, not that they even merit the word beliefs, most of them acted on in the cause of and in the context of cricket? I know it is all craven nonsense. Superstition is unreasonable, it is based on fear and ignorance. If you follow it you enslave yourself to it and you end up dependent on the most groundless rubbish. I am not just talking about not walking under ladders and being wary of the number 13. Why do I change my shoes or shirt or tie or toothpaste if I think or imagine or misremember (my favourite Hillary Clintonism) that this is what I was wearing/cleaning my teeth with the last time my team or Ed did well. Only mad people carry on like this. And I am not mad. If anything I have often been criticized for being too sane, too reflective, too normal, too balanced, if not a bit lacking in primary colours. So what on earth do my socks/tie/shirt/shoes/toothpaste (this is only the merest sample, the list is too embarrassingly long) have to do with anything? By the way, I ought to say straightaway that ties and socks can be a particular bugger, all that changing and fiddling and re-tying and bending and pulling on and then you miss the bus. In the summer months just getting washed and dressed and out of the front door can be more exhausting than a workout. No need for me to join a gym, forget Pilates. And the cupboard under the bathroom sink is now stacked with every kind of toothpaste; we?ve got a bigger range of toothpastes to offer guests than we have cereals, and we do have an awful lot of cereals. For a while the old-fashioned Euthymol seemed to be doing the trick, then Aquafresh became my banker, before I lost patience with them both and hot-headedly switched allegiance to Sensodyne (for those with sensitive gums, for those fans who are getting a bit long in the tooth). In one of Ed’s spells of low scores, an upsettingly bad run, I was backing all the horses by mixing all three toothpastes on my brush at the same time and fitting those small amounts of all three toothpastes on the bristles took me extra time (and we only have one bathroom, sorry everyone, when it comes to en suite we’re very off the pace, probably better to book yourself into a hotel), so I locked the door in case anyone caught me doing this, and I have to say I did not like the look on my face in the mirror’s ambush. If I was sitting opposite that bloke on the underground I would move my seat. I have of course in my time said all of those, and after saying the last one I was still stumbling around the ground half an hour after the last wicket fell, still in shock and unable to trust myself to drive home, when I saw coming the other way people in the same state, if not worse, stragglers coming back from the field of battle, shell-shocked, white-faced, wounded, staring, having supped full of horrors. Our faces could have been used in one of his films by Roman Polanski. And most terrible of all, it was my fault. I should never ever have said: “Well, one thing’s for sure, we can’t lose this one, not even we can lose it from here.” It was a salutary, stinging lesson. “I’m worried about you”, she said as she walked back into the room, tuning in to the familiar voices of Radio Kent Cricket. Oh, dear, what a delivery! A yorker speared into his leg stump. The perfect yorker. He’s yorked him on 99, and that, sadly, is the end of Smith. I was speechless with anger at her stupidity. Sometimes it is difficult to know what to do with a woman who behaves like that, especially one who should know better, a woman who knows the gods of cricket and their caprice, and even after all these years there was not a hint of repentance or apology. Mind you, the benefit to local charities from my superstitions is significant. With the tension building up on the morning of a match, buying my milk and my apples and my newspaper, I often put a bit more than usual into the St John Ambulance box on the counter because well you never know and someone up there in the gods’ pre-match studio may be keeping a twenty four hour watch on this shop and may be looking to reward my gift in kind. Once a whole pocketful of coins in the Air Ambulance box brought about a hat trick for Kent at Northampton. Fact. But the clinching evidence, as so often, concerns how we react to big money. One summer holidays I was walking down Tonbridge High Street – I was in my twenties then, this was way back – and I was doing a bit of hurried shopping before dashing off early to see Kent play a big one dayer, a quarter final at Canterbury, when I saw in the gutter a brown ten shilling note. A ten shilling note was worth quite a bit then. You want to know how much, do you? Well, I’m not sure exactly how much ten shillings would be worth in today’s currency let’s think of the equivalent oh it must be about, look I don’t know, do I, a few drinks anyway. Anyway, I knew a ten shilling note was enough to be missed by whoever dropped it. I stooped down and picked it up and dashed off to the police station on the corner of Pembury Road to hand it in. But before I got half way there I stopped, I was just outside Woolworth’s in fact, because I realized that by the time I had gone to the police station and added half an hour for the form being filled in by the duty officer who couldn’t find a pencil I would more than likely miss the opening overs at the St. Lawrence Ground in Canterbury, which was about an hour and a half’s drive away – this was before the M2 and M20. So, with the extra ten shillings in my guilty back pocket, I drove off in my maroon Mini, lovely sunny day, Kent countryside looking at its best, you just can’t beat England when it’s like this, can you, why go abroad, who’d want to live anywhere else when there was a loud bang and my windscreen shattered and the tiny bits of glass went all over my trousers and my sandwiches and the front seats and my Buddy Holly tapes and I spent three hours sorting it all out, not to mention coughing up GBP15 for the replacement windscreen, which meant I missed the whole day’s cricket, and of course we lost. A year or two ago, it was early May and bluebell time and the light was filtering between the leaves and I was walking through the woods a few miles from Sir Philip Sidney’s Penshurst Place, when a shaft of sunlight suddenly picked out something purply red just before the sloping blue carpet began. It was about six feet to the right of the path. I stopped and looked more closely and picked up a thickish wodge of GBP20 notes. The notes were damp: they must have been lying there a good while. How many hours I wondered had the unfortunate loser spent retracing his steps and scrabbling around in those woods? I looked around. No one in sight. When I got back to Southborough I tried to find the police station so that I could do the decent thing, only to discover that there was no police station, yes there had been a police station in Southborough the butcher said but it had recently relocated, well I should have known it would have, along with the public toilets (sorry these toilets are now closed, so there’s no point trying to bash your way in, that’s why there are padlocks and bolts everywhere, you’ll have to hold on if you can, your nearest public convenience is now in Aberystwyth). So I went instead into the Hospice In The Weald Charity Shop and handed over the money to a well spoken silver haired lady. It seems obligatory for charity shops to be staffed by well spoken and attentive silver haired ladies who can both speak perfect English and do mental arithmetic. What a combo. What’s more, she was the spitting image of my Aunty Eva. She looked down at the notes and then politely but steadily she looked up at me. I told her no I was not being generous and I had not had a nervous breakdown and I had played no part in the fifty million recently stolen at Securitas, Vale Road, Tonbridge, and that, unless she had any objection, I wanted The Hospice in the Weald to put the money to a good use. Just before I put the key in my front door, as I was taking off my walking boots in the porch, my mobile went. I knew who it was and I had a good feeling. I could tell by his tone of voice. 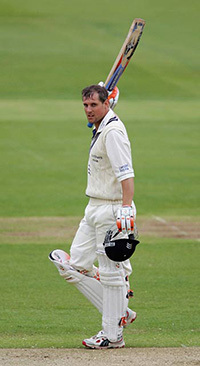 He was just out, but he – and his favourite bat – had made 116 against Lancashire. CricketWeb are grateful to Jonathan Smith and his publisher, Peridot Press, for allowing us to use this extract. You can read our review of “The Following Game” here. The book is available, a snip at GBP11.22, from The Book Depository, or alternatively from Amazon or any other bookseller worthy of the name. Great read. Shows honesty is the best policy.